The plate shown in the first picture was used on a fire-engine of the firemen (click here to see the full picture). It's curious to notice that there wasn't any seal on these plates and this is strange because the seal previously used, the fascio, was still perfectly compatible with the political position of the new republic. 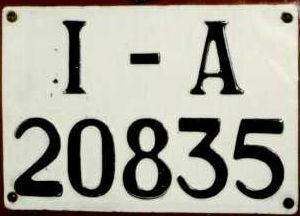 Even if the Social Republic lasted just one year, also other special plates were issued, mainly for military vehicles, as you can see in the pictures number 3 and 4. Unfortunately due to the war and the short life of these plates it is not totally clear their purpose and which vehicles used them. Brigata Nera: "Brigata Nera" means "Black Brigade" and this was the name used for fascist brigades. They were somehow unofficial, considered as "auxiliary" formations, each owned and ruled by its own commanding officer, located in the main towns of the north of Italy and their main activity was to hunt Italian partisans. This plate (picture number 3) was made of thick cardboard, like most plates of that time, with a special white paint to make them waterproof. G.N.R. : "G.N.R." stands for Guardia Nazionale Repubblicana (Republican National Guard) and you can see the full picture I took this plate (picture number 3) from in the old photo gallery (picture 4). G.N.R. was the police of the Social Republic and was made mostly by men of the previous Italian police who went back to the Italian police at the end of the war: it was independent till 1944, it was dangerous, used mainly in anti-partisan role and had the duty of keep the public order. Decima MAS: the last picture shows a plate of the flotilla Xª M.A.S., a special corps of the Royal Navy with very light and fast water vehicles, the MAS (Motobarca Armata Svan), that could bomb and sink big boats of the enemy. Actually the flotilla M.A.S. was not created during the Italian Social Republic, but at the beginning of the First World War and it became Xª M.A.S. in 1941; anyway I prefer to show this picture in this page because at the end of the Second World War the Xª M.A.S. was taken under the control of the Italian Social Republic. The plate in the picture has got black digits on white background, but I know about some plates with white digits on black background: obviously the Xª M.A.S. had more than just one kind of plate, even if it lasted shortly. You can find the full picture I took this detail from in the old photo gallery (pictures 6 and 7) where you can also find a short description of the Xª M.A.S., a picture of a front plate and a picture of a motorbike. Esercito Nazionale Repubblicano: the army of the Social Republic, the National Republican Army, was recruited at first among volunteers and trained in Germany by German instructors, but was not bright in its actions, except for the air force and at the end of the war many soldiers went back to the Italian army. Their plates had the letters RSI, but this is not totally sure. There were also other plates used for military vehicles. 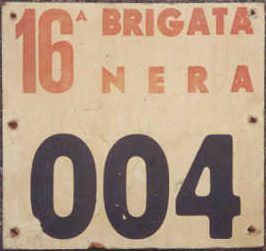 One of these plates had the letters AR (picture number 6), though it is not clear the meaning of them yet: for this purpose, it was proposed "Amministrazione Repubblicana" (Republican Administration), "Autoparco Repubblicano" (Republican Transport fleet) or "Aeronatica Republicana" (Republican Air force, even if in the documents it was usually referred as ANR, Aeronatica Nazionale Republicana). In the picture you can also notice two small circles on the sides of the plate, but it is not clear if they were simply the screw used to mount the plate or they were special symbols. In the old photo gallery (picture number 32) you can find the full picture I took the detail of this plate from. Another plate had the letters ES (in the picture number 7 you can see the plate ES 401 or 404, not so clear, that was mounted on a vehicle of the Alpine brigade Monterosa): also for this plate the meaning of the letters is not known, but it could stand simply for "Esercito" (Army). In this case the meaning of "Aeronautica" (Air Force) could be given to the letters AR. 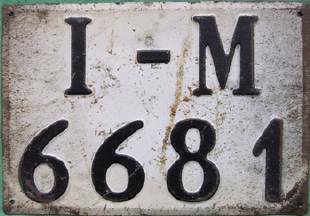 It seems that also the Independent Mobile Legion "Ettore Muti" of Milan had special plates for its own vehicles: they were square, with the letters L.A.M. on the first line and two or three numbers on the second line, all characters in blue on white background. Unfortunately I haven't got any picture of these yet. I found on Internet a very interesting page with all the forces of the Italian Social Republic, either those already named in this page, either the others: if you want to look at that, click here. Many thanks to Marcello Taverna for the first photo, to Alessandro Libanore for the second and the third interesting and rare pictures and to Karl Voltolini for the picture number 5. The picture number 6 is taken from the book "Storia fotografica del fascismo" written by De Felice and Goglia. The picture number 7 is taken from the issue number 1 of December 2002 of the newsletter of AISTA. A special thank also to Guglielmo Evangelista and to Roberto Pola for their help about the history of all these plates!